These two newspaper clippings relate to the visit of Walter White, executive secretary of the NAACP, to Topeka. The first is a photograph showing Senator Arthur Capper, a member of the National Association for the Advancedment of Colored People (NAACP) board of directors (seated left); Walter White, executive secretary of the NAACP (seated right); McKinley Burnett (standing left), Topeka NAACP president, and Reverend E. Bernard Hurd (standing right) of Calvary Baptist Church. 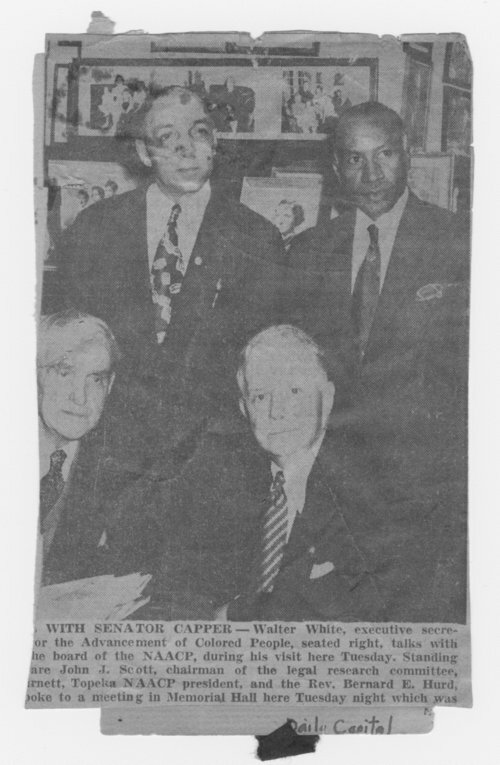 At the time of the photograph, John Scott, chairman of the legal research committee, NAACP Topeka, was standing to the left of Mr. Burnett, but he is not visible in this clipping. The second clipping is an article about Walter White speaking on civil rights at the Grand Army of the Republic (GAR) Hall of the Memorial Building in Topeka, Kansas on Tuesday, April 26, 1949, which Senator Capper attended.